While most of our collection has been donated, occasionally it's necessary to purchase exceptional items to preserve historical pieces related to Hillsdale County. Such is the case now. This 1931 Seagrave fire truck was owned by the City of Hillsdale for 84 years. The private collector selling it has found parts—and had other parts specially tooled—so that the truck is running again. 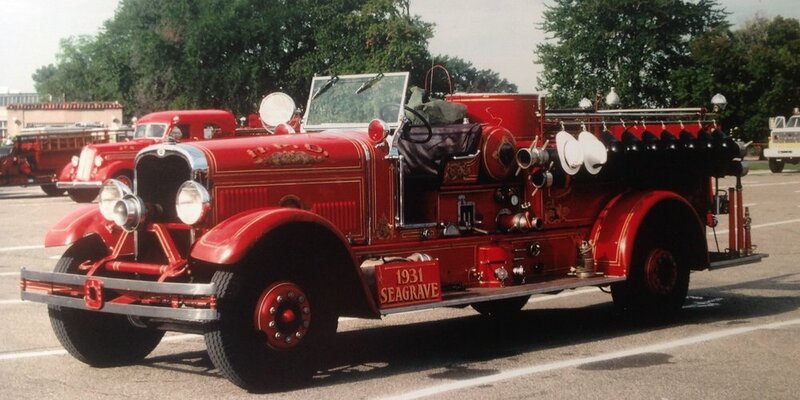 The Seagrave includes the original axes, helmets, silver bell, ladders and hoses. We ask for your help with the purchase of the fire truck, cost of maintenance and a proper storage facility to keep it when not on display. On May 18, 1931, the City of Hillsdale Fire Department moved to City Hall from its garage behind what is now Gelzer’s Hardware. That same year a Seagrave 750 gpm (gallons per minute) pumper was purchased. A work of art as well as a functional public safety vehicle, it sported the Seagrave logo on the lower area of the front hood and gold leaf decoration across the exterior. The Seagrave served Hillsdale well and was brought out of retirement to serve again after restoration on June 13, 1976. Compiling 150 Years in the Hills and Dale, a two-volume bicentennial history of Hillsdale County. Accepting the Will Carleton Poorhouse from Bob Evans Farms, then renovating it, its barn and its chicken coop through donations of money and physical items. Encouraging appreciation for county history through special tours of the Fairgrounds Museum and Poorhouse for hundreds of Hillsdale County students. Writing and making available throughout the county five “Ghost Walk” booklets, with short articles on important people, places, things and events in Hillsdale County. Establishing a website with over 300 articles about Hillsdale County. Placing two memorials at Oak Grove Cemetery, one honoring the women who developed its natural beauty and one at Potter’s Field to honor those, known and unknown, buried there. Placing a State of Michigan Historic Marker at Lewis Emery Park recognizing its importance as a training ground for Civil War soldiers and as an employment project during the Depression. Acting as caretakers of hundreds of significant historical treasures, including the William Whitney Civil War sword, the Bishop rifle made in Hillsdale in 1878, the Stock archives and various Indian artifacts.